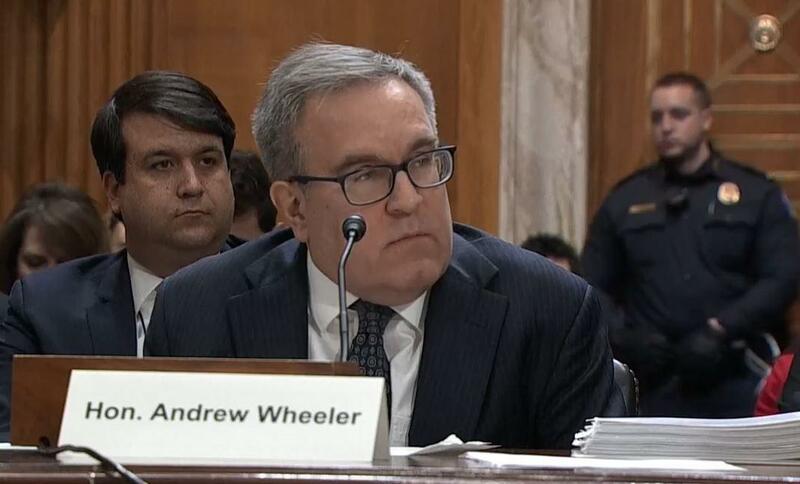 Acting EPA Administrator Andrew Wheeler at his Senate confirmation hearing. Wheeler noted one casualty of the ongoing partial government shutdown, now in its fourth week, is that a long-awaited plan on regulating the PFAS group of chemicals has been delayed. Wheeler also faced tough questions from Democrats on his beliefs over climate change and the extent to which, if confirmed, the EPA under his leadership would focus on reducing heat-trapping greenhouse gas emissions. Multiple lawmakers pointed to several high-profile rules issued by the agency last year -- including the Affordable Clean Energy Rule and Clean Car Rule -- where EPA’s own analysis shows carbon emissions will increase. After prodding, Wheeler said two -- a March 2017 meeting with Energy Secretary Rick Perry and one at the White House. He reiterated he had not attended nor set a meeting at EPA to discuss the plan. Environmental Protection Agency officials told a Congressional panel Thursday that the agency will announce by the end of the year whether it will take the next step to regulate a group of toxic fluorinated chemicals found in some water systems in the Ohio Valley. The PFAS group of chemicals, which include PFOA or C-8, were widely used to make nonstick products and flame retardants and have been detected in at least 10 water systems in Kentucky, Ohio, and West Virginia. Exposure has been linked to a number of health effects. EPA’s Director of the Office of Groundwater and Drinking Water, Peter Grevatt, told a House Energy and Commerce subcommittee that the agency will decide if some of those chemicals should be declared “hazardous” under federal law. One of the Trump administration’s first moves once in office was to freeze all grants issued by the U.S. Environmental Protection Agency. That move raised a lot of questions and a further directive limiting public statements from the EPA added to the confusion. The freeze has since been lifted but the move brought attention to an overlooked part of the EPA’s work: a grants program that has pumped more than $3.6 billion into projects in Kentucky, Ohio and West Virginia over the past 20 years. Senate Majority Leader Mitch McConnell says the Trump Administration’s latest regulatory rollback for coal-fired power plants will benefit Kentucky families — despite the government’s own analysis showing it will have little to no impact. Last week, the Environmental Protection Agency moved forward with plans to raise the limits on the amount of carbon dioxide new and reconstructed coal-fired power plants can emit. The EPA’s rollback will change Obama-era restrictions so that new coal plants can emit an extra 500 pounds of carbon dioxide per megawatt-hour. Kentucky power plants will have more time to clean up pollution leaking out of coal ash landfills and ponds under new federal rules. Last month, A WFPL News and Ohio Valley ReSource analysis found contaminated groundwater at 14 Kentucky power plants. That’s every power plant covered under the federal rules. The pollution comes from the piles of ash leftover from burning coal for energy. In Kentucky, the ash is stored in landfills and ponds that are mostly unlined — meaning there isn’t any sort of barrier between the coal ash and the soil.